choir croak out them goodies: The Zombies (with the Yardbirds) at the Wiltern. June 27, 2009. Los Angeles, CA. The Zombies (with the Yardbirds) at the Wiltern. June 27, 2009. Los Angeles, CA. It can be a bit frightening to see reformed bands for fear that their concert comes off similarly to a county fair appearance, where everything's more electric than it ought to be, easily giving away the band's age. I feel like this is a recurring theme here. What the Zombies have going for them that the Yardbirds don't is that they are working with new members with whom they've had ties – whereas the Yardbirds are essentially a new, younger band (that happens to feature Jim McCarty and Chris Dreja), the Zombies are working with bassist Jim Rodford (Rod Argent's cousin, Pete Quaife's replacement in the Kinks and a could-be Zombie from the band's start), as well as his son Steve on drums. 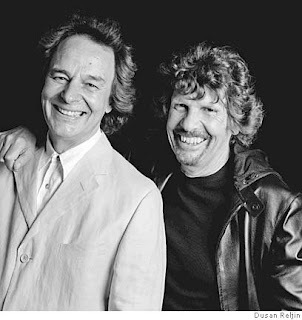 This show became an odd arena rock spectacle upon the inclusion of Argent's “Hold Your Head Up,” when the soft-spoken Colin Blunstone sort of took on a supporting role to Argent as star (this would happen again at the show's encore). Blunstone in fact was a great contrast to Argent, who frequently took over speaking duties to point out the legend in the band's 40-year old hits, and the value placed upon them by the likes of British mag Mojo. In fact, were it not for Blunstone, the band would possibly be lacking for charm these days – it is his voice, like Ray Davies' at its highest, still reasonably breathy and fully as sweet at its most subtle, that keeps the Zombies from sounding stale with the addition of heightened volume and power. Yes, the large size of the Wiltern meant the bang of Steve Rodford's drums was too prominent for the sweeter songs. Argent's Hammond was a bit indulgent at times, as were Keith Airey's guitar embellishments added to, for instance, set conclusion “She's Not There,” which would have benefited from a touch less electricity. And perhaps the bluesy “Mystified” was their county fair moment. But then, a few songs into the set, which had begun with “I Love You,” the band took care to play a cluster of songs from Odessey & Oracle (“A Rose for Emily,” “Care of Cell 44,” “This Will Be Our Year,” and “Time of the Season”), and Blunstone's uncomfortable steps and timid snaps briefly came to a halt when he showed perhaps some accidental passion, bending his knees in and throwing his arms out excitedly, as though he truly felt the anticipation in “Care of Cell 44,” and it was clear then that Blunstone is what makes the band so unbelievably lovely, even 45 years from their inception. Purchase the Odessey & Oracle 40th Anniversary concert DVD.